That was funny, I really like the still shot at the end, so great. Pretty good episode. 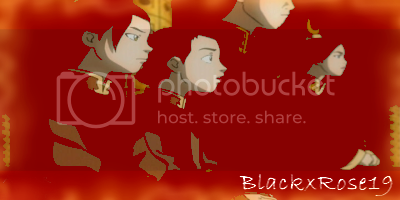 i liked how we got to see more of Zuko, Ty Lee, Mai, and Azula. I liked the Volleyball scene. I give it a 9/10. I wanted to see more of the Aang and crew. Also the Mind-Blasting man. Keeper of: Appas commanding growl, Sokka's "Appa's in charge", The dragonflies in Ba Sing Se's zoo, Hue's "Pants are an illusion and so is death"
I thought for some reason that Zuko was going to say he was angry at the Avatar. The episode was decent, but I think it could've been better. It was no Zuko Alone. I thought that the last scene was a bit too much telling instead of showing. Also, I wonder how long they've had these backstories? I don't remember Mai's mother being overly controlling in RtO, although watching it again with new information might chance that. Maybe that lady is actually her step-mother since there's such a big gap between her and Tom-Tom, but then again they look a lot alike. It was a good episode. I didn't like that they kinda left the thing with CM hanging, though I understand that the Gaang was the B-plot and they weren't getting much screentime anyway. As for the A-plot, I loved it It was great learning all these things about the Fire Nation teens. Ty Lee has six sisters?!? All looking like her?! Holy septuplets, Batman! And Azula did seem affected by the fact that Ursa preferred Zuko over her, though she admitted that Ursa was right in thinking she was a little monster hehehe, that was kinda funny. Oh Azula, you are so awkward around boys. So awkward and such a little psycho. Though she did get to make out a little bit, even if it was just one kiss. Did Ty Lee sound weird to anyone else? Or is it that I forgot what she sounds like because we haven't seen her in any episodes since Season 2? I also wish they would have told that Chan kid who they were. Though the look on his face when they were destroying the house was priceless. Overall, this episode was enjoyable. The character development was great, and needed. I loved Azula's maniacal awkwardness in this episode. Twas funny. EDIT: Hey, did anyone else find the out of place anime references annoying and unessecary? Like the little bird thing across Chan's face, and his expression. Also the guy who was crying and also had... mucus (for lack of a better word) coming out of his nose. Wow...words cannot describe how much I loved that episode. I thought it was amazing! Also, because I have to say this for all the Gaang fans, Combustion Man was pretty dang cool...so was the fight scene...But, who are we kidding? This epi. was really about Zuko, Azula, and the others. Avatar: The Last Airbender? No, tonight it was Teenage Angst Fest. But, I still loved it!!! By the way...who noticed the abscence of next week's episode preview? I thought it was 10 straight weeks! 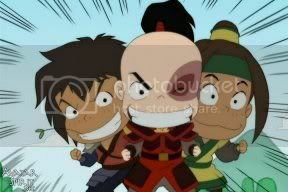 ~Keeper of: Azula's possible soul/heart, Toph's crazy poofy morning hair, Crazula's crying in the finale. Honor means nothing if you dont know loyalty. Azula I think wants to think like a NORMAL teen, but for her to get the thrown, she has to cover up all joy/happyness(what little she has) with Anger/hate/tearing people down/picking Zuzu/and making fun of uncle. Thats why she is daddy's little monster. mom's also. I didn't really like that episode all that much. It was really random, and I'm usually a fan of random. Azula trying to act like a normal teenager did nothing for me. I couldn't even understand why. The Gaang's small part was very cool, and Sokka with his hair down was a plus. A part I did like was Zuko going to the house and remembering the past. Well, at least he finally realizes he's angry at himself. All in all, I guess everyone revealing their problems at once was a good way to explain things, but it didn't really work for me. And it's psychology hour on Avatar! Complete with stories about people's mothers. All that was missing was some of those reclining couches around the fire. This episode seemed a little sporadic to me. Little five minute action scene with Mr. Metal Blowy Uppy Eye Guy, then some Fire Teen character development. I loved how all four of them were terribly socially inept, though. Especially Azula. WE SHALL BE THE MOST POWERFUL COUPLE! *blue flames* Priceless. Good to have continued insights into FN culture as well. Overall good episode, if a bit weird. Also, blatant fan service for the win. Azula trying to laugh was the funniest thing. Zuko imitating Ty Lee was quite amusing too, even though I don't think I was supposed to laugh there. New Momo hats! All the rage for fugitive waterbenders! Get yours today! Li and Lo were so cute! Ty Lee cried. Azula almost cried! Zuko almost cried! Mai has a reason for not showing emotions. Zuko likes seashells (hehe). That family portrait was so sad. Ozai used to be a good dad!??? Azula was so awkward. It was cute. And she got a kiss! Ty Lee had some cleavage!! I have never laughed so hard in my life. I love the fact that Azula is just as socially awkward as Zuko is- that was unexpected and downright hilarious. 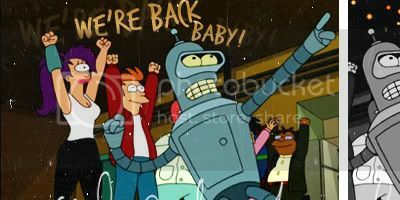 The bad guys really got their day, and it was a great episode. Azula is rapidly gaining a place in my heart. Part of me pities her just a little bit. I'm glad she got some flaws. 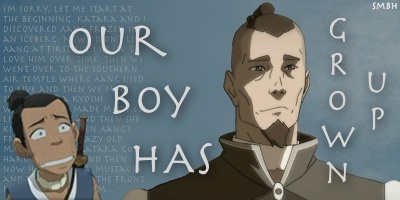 And Zuko... I really liked him in this episode. Say what you want about him, but the boy does try. I think he and Mai are cute, in the fact that they balance each other out. Zuko's a temper mental hothead, and Mai's too cool to care. And, apparently, Ty Lee's a man magnet. I want more Laser Head man! btw, what happened to the next epppie preview? Did Mai's voice sound off? I laughed , I cried :'(, I was on the edge of my seat . I think Dante Basco had a cold or something. Anyone else notice the change in his voice? Anyway, Azula dominated the laughs in this episode. I think he's going through puberty!! quick question, when aang did that awesome jump up, turn around and blast combustion man's fire to propel him backwards into a huge rock thing...was that firebending or air bending around the fire? Toph: "Well that was random"
That pretty much sums up the episode for me. Oh man, I just loved that episode. Whether it's from Li and Lo, to the Aang gaang fight with the "Exploding things with his mind" to the confessions on the beach, it was just so awesome. Was nice to see everyone from Zuko's gang and such in a relaxed environment, even though they weren't really all that relaxed. Azula on the beach during the volleyball, then trying to impress the guy, and then at the end was just priceless. Her little moment with the guy on the balcony was classic. Anime face/freakout for the win. Her moment with Zuko on the beach was pretty nice too. The Aang gaang at the swimhole was pretty funny. Amazing those two fire nation guys see him, but nothing happens. Then when the "Guy who explodes things with his mind" showed up, it picked up. The fight scene, although small.. was pretty intense. I enjoyed it immensely. The way Aang got away was pretty awesome and clever too. Rock-armor ftw. Either way.. 10/10 here. I don't care if it's "filler" or not. This episode was made of so much epic win. This was incredible. Loved all the character insight. Azula's social awkwardness with her peers was interesting, and before seeing this ep all the way through I wouldn't have questioned whether or not she really regretted what she said to Ty Lee - but now I wonder a little. I was surprised that Zuko wanted to burn the portrait - before he announced he was mad at himself (which makes sense) I thought he was going to say he was mad at his mother for leaving. I liked that they showed all the past moments and the seeming "friendship" among the royal family members here, even despite all the hell and hatred that's come up as well. That kind of seemingly contradictory feeling among famiy is a good example of how hard family relations can be. Of course, the trashing of the house was good fun. Combustion Man's... combustion beam or whatever, was wonderfully animated. by the guy with the eye on his head and then it goes in slow motion and aang blocks the explosion. The reason I was mad about it was because it was in the trailer for the third season and on the trailer it looked like he was bending fire. So I thought he would do that big explosion thing by himself. did anyone else think he was bending fire on the trailer too ,or was it just me? Well I don't usually do this but since I'm here I decided to write. It started out as a typical filler episode with zuko and the girls but it was still pretty good. I liked them addressing azula's social awkwardness around people not in uniforms and her destroying people's lives. Zuko addressed that he was still conflicted about Ba Sing Se and Mai and Ty lee. Zuko's assassin finally caught aang and the gaang. It was a pretty good fight but not playing any music during it really made it stand out for me. The only thing I'm mad about is that nick robbed me of a preview for next week...unless it's not playing next week. I give it an 8. I loved it but it seemed like one of those epsiodes where they try and get you to sympathize with the characters in one episode. But I giggled throught out the whole episode. Zuko's shirtless scene was like 'oh god no' and fangirls did scream right after it. The circle of confession thing was kind of cheesy, but I liked how they put all the emotions in togehter, especially to Ty Lee and Mai. Kudos for the "random remark"
Conclusion: Funny, but the fire nation story kind of felt....teeny boppy. I wanted my epic fights and at least they it with Aang. This is Getting Old ain't it?